As the Indigenous art movement has developed in Australia, it has continually been refreshed, renewed and reinvigorated by the appearance of new, elderly artists. Whilst this has been something of a unique feature to Indigenous art, it follows a certain internal logic. It is these older artists who remain closest to the pre-colonial cultural traditions which make Indigenous art unique, and, as Indigenous culture places a premium on seniority, it is these ‘elder’ artists with the greatest cache of cultural knowledge to draw upon. The Indigenous art market, in particular, has helped reify the notion of ‘elder’, making it a common refrain of commercial gallery sales pitches, in which each and every geriatric Aboriginal artist is carefully positioned as a profound repository of arcane spiritual and cultural knowledge. Unfortunately, this simple reification of age does not accurately reflect traditional Indigenous power systems, which are based on far more complicated stratifications of ceremonial knowledge, clan affiliations, gender, custodial rights and responsibilities. The reduction of cultural seniority to the egalitarian category of ‘elder’ fails to recognise the personalities and backgrounds of individual artists. Just because an artist is elderly, it does not necessarily follow that they are an Elder in a ceremonial, custodial or leadership capacity. This may seem like a pedantic point – particularly in relation to an exhibition as gloriously celebratory as Emerging Elders (National Gallery of Australia, 3 October 2009 – 14 June 2010). And yet, it points towards a profound disjunction between traditional Indigenous cultural and aesthetic values, and the art market. On the one hand, the market supposes to hail the continuation of culture – celebrating Indigenous art for its ‘stories’ and cultural knowledge. On the other hand, it is often not the most culturally important works or artists who are most popular in the marketplace. In some instances, senior artists work is considered too ethnographic or rigidly traditional for a market which prefers bold, individual expressionism. In other cases, the more culturally knowledgable artists work across too many styles or stories – something which gives them great kudos amongst their peers, but is less attractive to a marketplace that favours easily identifiable ‘trademark’ designs. These are questions that overshadow the reception of Indigenous art. They are questions in dire need of address if non-Indigenous Australians are to begin to have any meaningful engagement with Indigenous art. They are not insurmountable questions, but ones which require a patient, careful and considered cross-cultural dialogue on aesthetics and value. Despite being evoked in the exhibition’s title, however, these urgent questions are not answered in Emerging Elders. First and foremost, Emerging Elders is a celebration of contemporary masterworks from the National Gallery of Australia’s collection. Like the Gallery’s 2007 Triennial of Indigenous Art, it lavishly showcases the institution’s ongoing commitment to collecting and exhibiting the finest examples of contemporary Indigenous art. Indeed, many of the nation’s leading artists are represented with major works. Gulumbu Yunupingu’s shimmering bark paintings of Garak, The Universe make a majestic centrepiece to the exhibition. And yet, their presence inevitably causes one to question the category of ‘emerging’. Gulumbu is a former winner of the Telstra National Aboriginal and Torres Strait Islander Art Awards, her designs adorn the ceiling of the Musee du Quai Branly in Paris and in 2006 she was awarded the Deadly Award for Visual Arts. 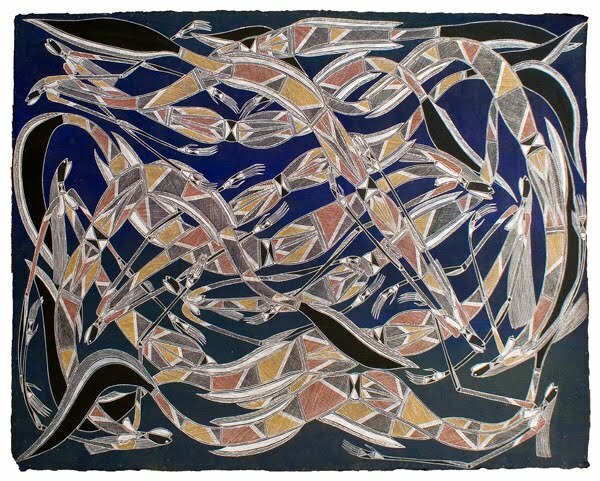 By every possible standard, Gulumbu is an established and major figure in Australian art. The same could be said of many of the artists in Emerging Elders – such as Ningura Napurrula, Shorty Jangala Robertson or Dorothy Napangardi – who have all had long and distinguished careers. Others seem to have emerged to the very point of over-exposure, such as the prolific Bentinck Island Elder Mirdidingkingathi Juwarnda Sally Gabori, who has been a ubiquitous presence in recent Indigenous art exhibitions. It is the artists who fit most comfortably into both categories whose voices speak most commandingly in Emerging Elders. 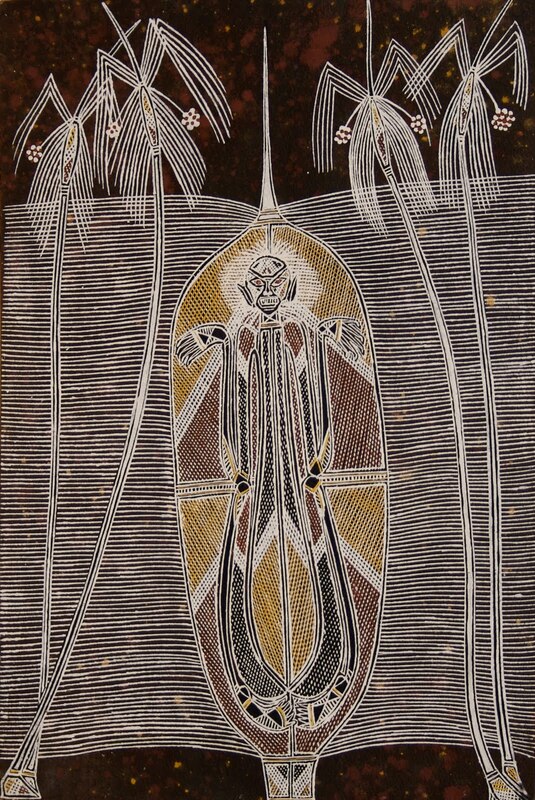 Born in 1928, Harry Tjutjuna of Ernabella is represented with a spectacular depiction of the Wangka (Spiderman) Tjukurpa. Glowing in an incandescent haze of orange, red, yellow and black, it is like a grand, pop-art rendering of an ancient Dream. It speaks with a bold visual inventiveness that asserts its presence and the authority of knowledge it contains. Other works speak just as authoritatively, but in a hushed voice, whose gentle overtones whisper of a different time and place. Kimberley elder Alan Griffiths painting of dancers engaged in the Mindarr and Waringarr ceremonies bristles with the action of a giant carnival while locking into an ancient schemata that fills it with a still, silent nostalgia for past times. Elizabeth ‘Queenie’ Giblet’s Pa’anmu (Headbands) for Laura Festival (above) evokes a faded memory of ancient ceremonial markings through her understated and elegant use of grey, black and white. These works conjure the air of a passing epoch – a time when the ceremony ground would fall silent in anticipation of the Elders’ command. And yet, they also show the continuing power of this voice in contemporary art. They show how the Elders’ voice can continually emerge, to be reshaped into dynamic and relevant contemporary statements. It is these works with the power to once again strike us silent with awe. This following essay was written to accompany Graham Badari’s first solo exhibition, held at Mossenson Galleries Perth, March 16 – April 25, 2010. A pair of red eyes glowers from an angular, skeletal visage. Its snarling grimace revels sharp teeth, its razor-like claws borne forth ready to strike. This is one of the unseen dangers of the bush: Namarnde, the malevolent spirit of the box pandanus. When pregnant, Kunwinjku women avoid walking too close to pandanus bushes, in case Namarnde captures the spirit of their unborn babes. In Graham Badari’s painting, this terror is brilliantly evoked through a combination of jagged ferocity and delicate cross-hatching or rarrk. His painting transports the viewer to the mystical landscape of the stone country, where spirits inhabit every crevice and ancient paintings adorn the rock-faces. At the same time, Badari’s Namarnde is uncannily futuristic, bearing a striking resemblance to the cyborg Maria from Fritz Lang’s 1927 sci-fi epic Metropolis. 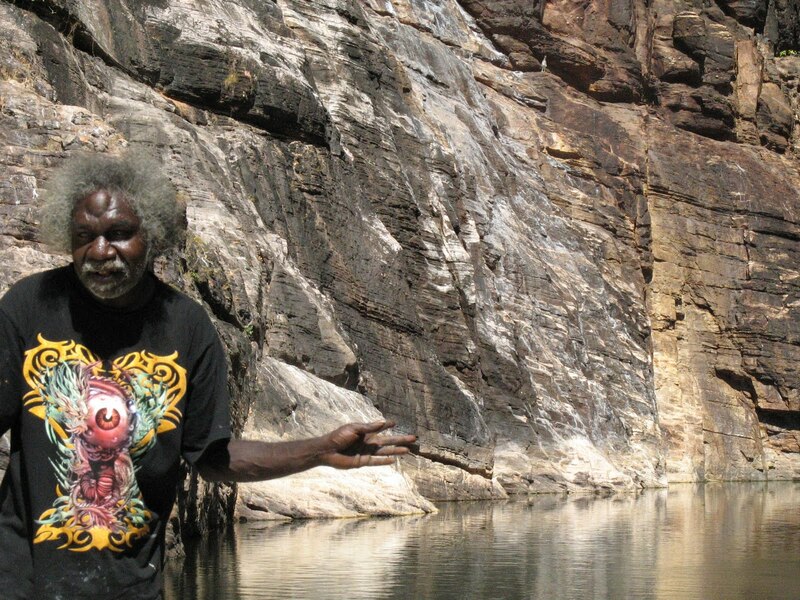 Graham Badari was born in 1963 at Gunbalanya (Oenpelli) in Western Arnhem Land. His country is Maburrinj, near Kudjekbinj, about 120 kilometers east of Gunbalanya. 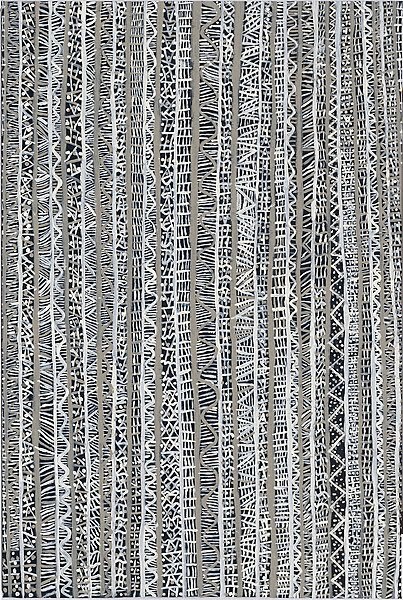 He was raised by the renowned artist Djawida Nadjongorle, but like many of the artist at Gunbalanya, credits the late Thompson Yulidjirri as his greatest artistic influence. From these senior men, Badari learnt the fluid and dynamic style that defines Kunwinjku painting at Injalak Arts. He began painting sporadically around 1990, but in recent years, his career has gained a new focus and momentum. Following the recent passing of many of the senior artists at Gunbalanya, Badari has become one of the leaders of a small coterie of dedicated artists, which includes Wilfred Nawirridj, Glenn Namundja, Gabriel Maralngurra, and Gershom Garlngarr. They are a ubiquitous presence at Injalak Arts, and are fiercely proud of their art, community and art centre. Their paintings show a faithful dedication to the visual language of their rock-art heritage, while remaining committed to artistic innovation. It is this beguiling balance of tensions – innovation and tradition, ancient and modern, beauty and terror – that energises Badari’s paintings. And yet, to understand how his work could so effortlessly embody these apparent dualities, it is necessary to understand how these competing positions coexist within Badari’s worldview, informing his unique and eccentric personality. With his impish smile and cheeky sense of humour, Grahama Badari or ‘Grammy’ as he affectionately known, is the gentlest of souls. He is a popular figure at the art centre, a beloved tour guide and font of community news. And yet, as his paintings suggest, Badari has a fascination with the darker side of life. Walking in the bush, he is careful to warn of the dangers of Namarnde or other malicious spirits such as Namarrodoh. Always concerned with the safety of his guests, he cautions of the equal dangers posed by the very present Kinga (salt-water crocodile) and the more otherworldly Ngalyod (Rainbow Serpent). Badari believes wholeheartedly in the presence of these spirit beings; they are an intrinsic part of the cultural heritage that has informed his life. On the other hand, Badari is sensitively attuned to the modern world. The ease with which he traverses this cosmology of the mystical and the everyday might go some way to explaining his attraction to western science-fiction and fantasy imagery. This passion is not only evident in Badari’s paintings, but in his distinctive choice of fashion, which favours the kind of lurid fantasy t-shirts more commonly seen on teenage heavy metal fans. Perhaps unsurprisingly, Badari is also a keen follower of heavy metal music, with his favourite band being the Swedish group Hammer Fall. 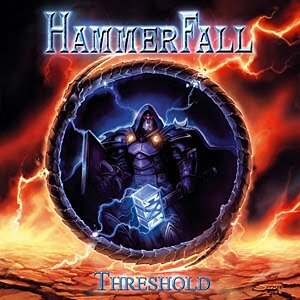 Indeed, it is worth comparing Badari’s depictions of Namarnde and Namarrodoh with the red-eyed, hammer-wielding leviathan featured on the group’s album covers, designed by renowned graphic artist Samwise Didier. That said, when questioned on these striking visual parallels, Badari is quick to refute such influences, preferring to highlight the traditional aspects of his work. To Badari, these are ancient stories that he holds in the deepest respect, and he rejects the suggestion that he might be trifling with them by bringing in profane external influences. And yet, it is this disavowal that reveals the very essence of Badari’s paintings. For in suggesting that his works are a ‘fusion’ of the traditional and the contemporary, it is vital to note that this is not some sort of wry pastiche of ironic allusions and winking ironies. Badari’s work contains none of this post-modern disingenuousness; he is an artist of deep, abiding integrity. The meticulous care that he takes with his work, with its fine attention to detail and delicate rarrk, is a reflection of the reverence with which he holds both stories that he paints and visual tradition they embody. Badari’s paintings are heartfelt depictions of his cultural heritage, and he paints them with all his being, striving to make them as vivid, striking and beautiful as he knows how. If they are a fusion of old and new, it is because Badari’s worldview completely, comfortably and intuitively traverses both Indigenous and western episteme. His paintings are reflections on a living culture – one that encompasses both ancient tribal songs and heavy metal riffs. Like all great artists, Badari captures the spirit of his time, and through his unique artistry, brings tradition forward into a dynamic contemporary vision. A truck screams across the desert. The heat belting down upon the asphalt makes it glow a deep, languid blue. The driver has his eyes fixed forward upon the road as it stretches out onto the horizon. His face bears a wobbly smile, as though absorbed in the rhythms of the latest catchy tune blaring on his car radio. Around him, the desert rises in glorious majesty; purple mountains ascend into a crimson sky that beams down upon the desert’s gleaming yellow sands. But the driver does not note this grandeur for he is transfixed by his journey, his eyes planted firmly on the highway as it speeds him to his destination. For Billy Kenda, the desert landscape is a place of Arcadian splendour. His depictions of country are the sanguine songs of a contented heart; prelapsarian odes to his beloved desert idyll. Rolling hills recede into the picture plain, enveloping the viewer and drawing the eye inwards in a transitory recession. Born in 1972, Kenda began painting in 2004 through the auspices of Mwerre Anthurre Artists (Bindi Inc) in Alice Springs. His father was a Ngaatjatjarr man from Docker River, but Kenda’s paintings are dominated by his mother’s country near Jay Creek in the West MacDonnell Ranges. This is the country where Kenda was raised in the shadow of the purple hills made famous by Albert Namatjira, and in many ways, Kenda’s paintings continue the halcyon vision of his artistic forebear. And yet, increasingly, Kenda’s landscapes have become dominated by motor vehicles. Cars and trucks speed across the landscape, blocking it, and drawing the viewer to the foreground of the image. At times, these vehicles dominate the picture, and the landscape becomes little more than a hurried, unfocussed blur at the edge of the canvas. In Kenda’s paintings, the motor vehicle becomes a metonym for the encroachment of western modernity upon the Indigenous cultural landscape, offering a subtle, but powerful critique of western vision and our reluctance to embrace or acknowledge an Indigenous view of the land. It is in this sense that the comparison between Kenda and Namatjira is perhaps most apt, for it was in the works of Namatjira that western audiences were first exposed to an Indigenous vision of the landscape. In his depictions of country, Namatjira appropriated the western tradition of landscape painting as a means of empowering Indigenous perspective. As Ian Burn has noted, “The Arrente style may be interpreted as a strategy to control what is secret and what is sacred, while still expressing to a white audience an Aboriginal relationship to the land,” in order, as Galarrwuy Yunipingu continues “to demonstrate our continuing link with our country and our rights and responsibilities we have to it.” Namatjira’s paintings present a defiant call to see the landscape from an Indigenous viewpoint. In doing so, he helped inaugurate the Indigenous art movement which has gone on to be one of the dominant frontiers upon which Indigenous peopl e have engaged with modernity and shown their culture to be relevant, contemporary and strong. Despite their apparent joviality, the work of Billy Kenda sits at a forceful critical intersection of this visual engagement with the hegemony of western vision. As western society spread into the heart of the nation, highways were built across the desert – Kenda’s traditional homeland. But highways are built upon the principle of fastest movement between origin and destination; upon the assumption that what lies between is unimportant. Margaret Morse has theorised that the car becomes the de-realised ‘non-space’ that allows us to negotiate this distance. In the interior of the motor vehicle the traveller is insulated from the outside world, achieving what Morse calls a ‘mobile privatisation’ that serves to displace or separate us from our surroundings. This contrasts severely with an Indigenous cosmology, in which it is songlines and not highways that run across the country connecting all places, people and things. In this worldview, travel becomes a process deeply connected to the landscape; a process of continuity, identity creation and placedness. But the songlines of the highway are insular; disconnected. This is how Kenda depicts his drivers, absorbed in the detached world of their mobile cabin, bopping along in ignorant bliss to the enveloping beauty of the world around them. When cars are absent from Kenda’s landscapes, the landscape recedes into the picture plain, inviting the viewer to travel across Kenda’s country, to footwalk his hot sands, to taste the desert air and feel the heat upon one’s brow. The inclusion of cars refuses this engagement, pulling the landscape up flat and disallowing travel into the picture plain. Here we find the metaphor of Kenda’s paintings. They are a call to return to the landscape, to escape western vision and to actively see and engage with the world around us. Kenda’s paintings are a challenge to look beyond our assumptions; to see our blindness to the beauty of the world just beyond our frame of reference. For it is here, in the Arcadian splendour of the landscape that the real joy of Kenda’s paintings can be found and from which stems their unique vision and joyful contentment. No matter where one is, no matter how strong the force of errantry, one can hear the mounting desire to “give-on-and-with,” to discover order in chaos or at least to guess its unlikely motivation: to develop this theory that would escape generalizations. By Glissant’s own admission, Relation cannot be defined, only imagined. Poetics of Relation is an extended attempt to circle round this indefinable, that it might find focus in the margins where the text points to the fabric of its own construction. Glissant’s writing is fragmentary, filled with interjections, repetitions, and other tactical devices designed to delay or suspend the unilinearity of his argument. As his translator Betsy Wing notes, Glissant constantly destabilises French, creating new linguistic formulations in order to mimic the transformations of a living language and the collisions of culture that he sees as productive of Relation. This circuitousness is intended to build a body of examples that intimate Relation without ever fixing it to the totality of a single definition. As Relation is the result of encounter with the Other, it remains engaged in a complex relationship with the atavistic identity (and its attendant colonial oppressions). It is only through the spread of the atavistic identity that the encounters that lead to Relation are made possible. Thus, Relation has its genesis in the hulls of slave ships crossing the Atlantic, while the atavistic identity contains within it the antinomies that create the preconditions for the emergent subject positions that would eventually undermine its unified identity. Glissant is careful not to suggest Relation as a counter, but equally dualistic identity position. This poses certain difficulties, for Glissant recognises the value of stable identity positions as the sites of decolonial resistance. 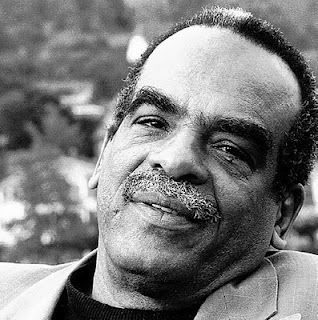 Relation is an attempt to move beyond the dialectic positions that such identities have tended to assume (such as Negritude, Historical Marronage or even Aboriginality), recognising that such subject positions are necessarily limited from the very beginning by assuming subject position made available only in opposition to the oppressor. This is not to suggest that Glissant is opposed to identity, as he explicitly notes, Relation is neither a rejection of identity, nor “inconsistent with the will to identity.” Glissant recognises that concrete identities (just like the specific places of the archipelago) are a necessary part of exchange. For Glissant, identity construction enforces the sense of Relation, but this self-realisation is not enough, it requires the realisation of Relation. Thus, although Glissant clearly sees Relation as a political intervention, it can never be an organizing form of resistance. In part, this is because Relation takes its fullest expression in the poetic realm, where poetic thought safeguards the particular, relating all possibilities. This poetics is exemplified in the process of creolization, where the emphasis is placed upon the processes and not by the contents on which these operate. Open to constant transformation, for Glissant, creolization represents the clearest illustration the concept of a poetics of human relations. As it is open to all possible particulars, creolization necessarily excludes the possibility of futurity. For Glissant, futurity is one of the driving forces of the atavistic identity, which reaches exhaustion in Relation. While concluding that the age of classicism is past for all cultures, the importance of this antinomic relationship between Relation and the era that precedes it, suggests that Glissant is not only interested in defining the contemporary situation, but also in revising our understanding of modernity. Despite its elusiveness, Relation provides a most useful framework for considering decolonial identity beyond the polar terms of resistance or submission to the dominant colonial power. For although Relation is the ultimate tool of decolonisation, Glissant notes that it was also born from the long and painful quest to assert identity “in opposition to the processes of identification or annihilation triggered by these invaders.” That this tendency has led to a dialectical tension within decolonial self-identification can be seen clearly in Marcia Langton’s canonical discussion of ‘Aboriginality,’ in which she intuitively recognises both the political power of identification to “lessen the pressure of assimilation,” while simultaneously noting that this only has meaning when understood in terms of inter-subjectivity that dissolves particularlity in favour of the unity of a singular Other. In the concept of Relation, Glissant offers a framework to move beyond these polarities, to instead see them as the first step towards recognising our shared world of infinite difference. Instead of fixed places of origin, he offers sites of connectivity, where multiple histories and ways of being can coexist. Instead of roots, he offers the dynamic process of creolization, a poetics defined by its openness to transformation. Instead of a world of nations, he offers the archipelago, an image of the world in which we are all connected while remaining distinct. Édouard Glissant, Poetics of Relation, trans. Betsy Wing (Ann Arbor: University of Michigan Press, 1997), 183. Betsy Wing, ‘Translator’s Introduction’, in Glissant, Poetics of Relation, xii. Glissant, Poetics of Relation, 1. Édouard Glissant and Manthia Diawara, “One World in Relation: Édouard Glissant in Conversation with Manthia Diawara,” Nka Journal of Contemporary Aftrican Art 28 (2011): 9. Glissant, Poetics of Relation, 17. See particularly Ibid., 78-79, where Glissant suggests that Relation has been present from the beginning of modernity, reaching its complete fulfilment in the contemporary moment. Marcia Langton, “Well, I Heard it on the Radio and I Saw it on the Television…” (Sydney: Australian Film Commission, 1993), 32. Like Ward, these Wandjina are a long way from their Kimberley homelands. And yet, this distance does not weaken their spiritual or elemental power. For the Ngarinyin, Worrorra and Wunambal people of the north-west Kimberley, the Wandjina are the central figure of religious significance. According to legend, they were the physical manifestation of great spirit beings who controlled the elements, such as wind, lightning and rain. During the Ngarrangarni or Dreaming, their actions and adventures shaped the landscape and helped create Indigenous law. At the end of creation time, they left their images on the rock faces and escarpments, in order to watch over the country and its Indigenous inhabitants, and to ensure the continuity of traditional law. Over milenia, the repainting of the Wandjina has become a sacred act of passage, connecting the Ngarinyin, Worrorra and Wunambal people in an unbroken link with both their ancestors and the Ngarrangarni. 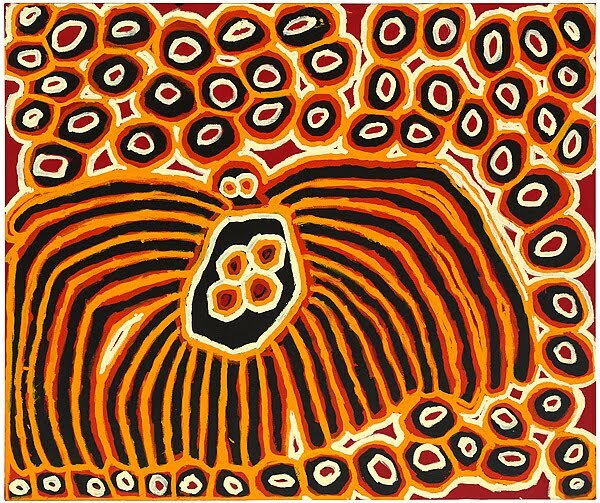 The power of this ancestral connection, and indeed, the power ascribed to the imagery of the Wandjina, reflects the unique spiritual temporality of the Ngarrangarni or Dreaming. As W.E.H. Stanner notes, although the concept of the Dreaming evokes a heroic time when ancestral spirits roamed the earth, “one cannot ‘fix’ the Dreaming in time: it was, and is, everywhen … a kind of logos or principle of order transcending everything significant for Aboriginal men.” The essence of Ngarrangarni runs through all things and connects every point in time and space. Adherence to its fundamental and mystical truths is the driving force for senior Indigenous people like Ward, shaping their lives and world-view. It is this essence that explains the power ascribed to the image of the Wandjina. This is not only a spiritual and elemental power – such as the power to bring on rain in Perth, hundreds of miles from their ancestral homelands – but also their power as profound visual statements that challenge our western preconceptions of time, space, aesthetics and value. Lucy Ward began painting in 2003 and has since established herself as one of the leading contemporary painters of the Wandjina. She has exhibited throughout Australia, as well as in Asia, Europe and America, and has held eight solo exhibitions through Mossenson Galleries in Perth, Melbourne and Sydney. 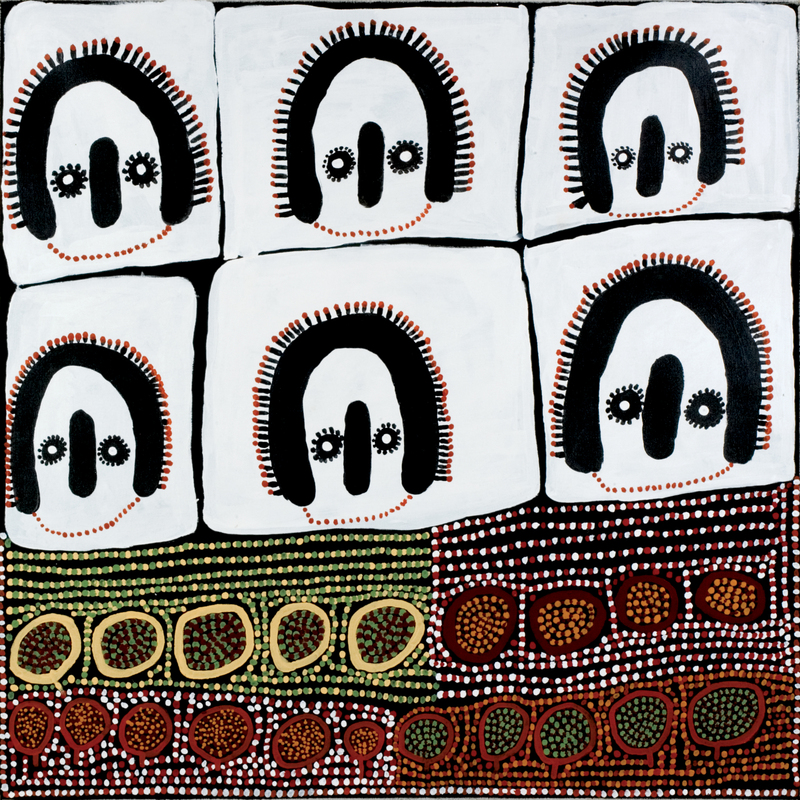 Her works are held in several important public collections, including the Art Gallery of Western Australia, the Western Australian Museum, the Berndt Museum of Anthropology at the University of Western Australia and Macquarie University. 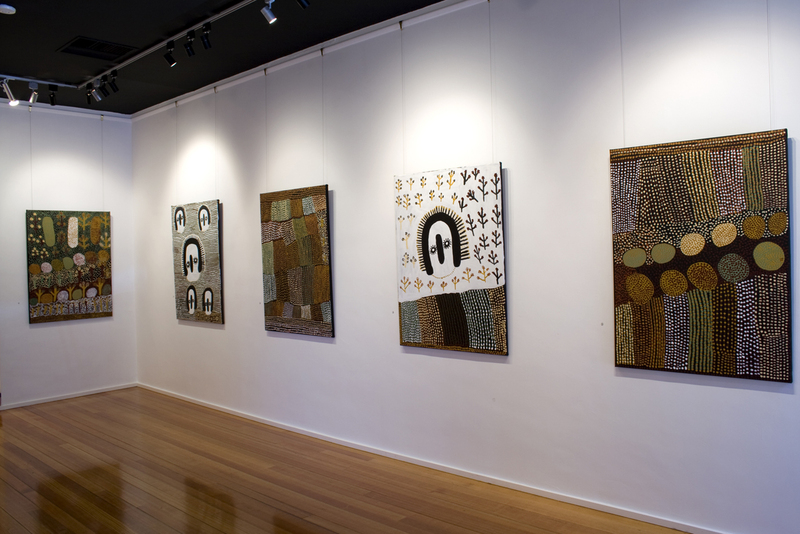 In 2006 she was awarded the City of Stirling Art Award, and she has been a finalist in numerous major art prizes, including the Telstra National Aboriginal and Torres Strait Islander Art Awards, the Wynne Prize, the Arthur Guy Memorial Painting Prize, The Alice Prize and the Waterhouse Natural History Prize. Ward’s childhood was spent traversing the Ngarangarri and Winyiduwa clan estates with her father and grandfather. From these old men, she gained first-hand knowledge of the hunter-gather lifestyle: hunting kangaroo, emu, fish and prawns and gathering yam and edible water lilies. They also introduced her to the ancient artistic practices of the Ngarinyin, and she recalls fondly watching them paint “the really Wandjina in the caves.” As she matured, Ward worked on the burgeoning Kimberley cattle stations, both as a domestic servant and well as mustering and tailing cattle. But the formative experiences of her childhood remained with her, and during the wet season, when monsoonal rains locked the cattle industry down, Ward and her Ngarinyin kin would return to their ancestral estates for ceremony and to tend to their country. Like her life, Ward’s paintings are a balance of sorrow and joy. 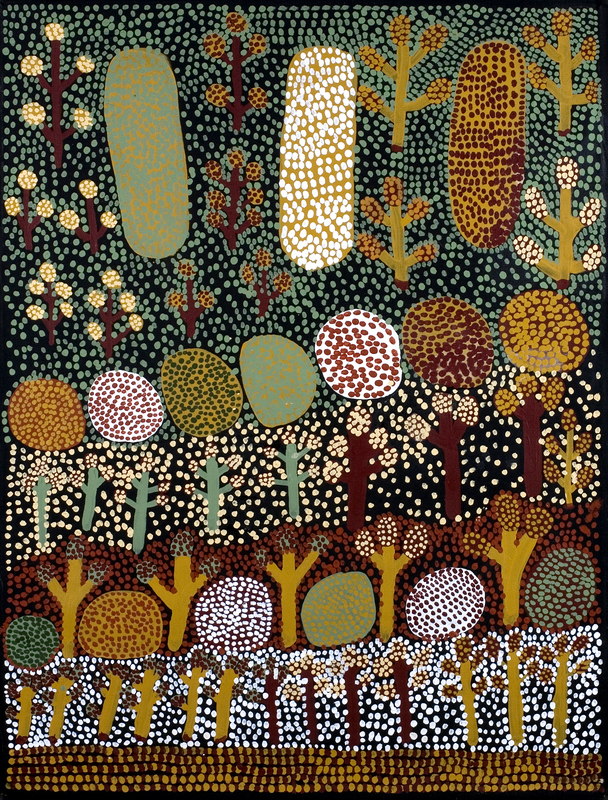 In many of her canvases, a single Wandjina is painted in isolation, surrounded by swathes of colourful dotted squares, signifying the ‘sugarbag’ or bush-honey pod. According to Ward, in the Ngarrangarni, this Wandjina broke with traditional law, and took another man’s promised wife. This angered the man’s family, who pursued him across the country, seeking to punish him for this indiscretion. They finally caught him in Ngarangarri country, where he was beaten, speared and killed. From his prostrate body rose the sugarbag trees, making Ngarangarri country the land of honey. It is a powerful story of the connection of all things. In death there is creation; in punishment there is redemption; in the bitterness of tears, the sweetness of honey. During his fieldwork in the Kimberley in the early 1960s, anthropologist Ian Crawford noted several rock-art sites in which the sugarbag motif was prominent. Reproduced in his landmark 1968 volume Art of the Wandjina, the cave paintings of sugarbags are clear artistic precursors to Ward’s early paintings. Like her Wandjina, this comparison reveals how much Ward’s work takes its core inspiration from her rock-art heritage. This etymology is easily overlooked in Ward’s work, particularly in light of the explosive acrylic palette favoured in her early paintings. 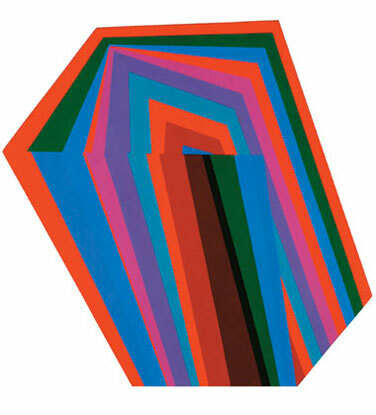 Like the cave paintings of sugarbags, Ward’s earliest depictions show the sugarbag motif as distinct, individual objects. Each honey pod is depicted as an irregular square or circle filled with coloured dots. Sometimes these squares or circles are sub-divided, while in other cases they are not. In late 2005, however, a major development began to occur in Ward’s portrayal of sugarbags. The sugarbag became an increasingly open signifier, whose individual unity slowly disappeared. In her most recent works, such as the monumental diptych Ngara (Sugarbag) Story 2008, exhibited at the Arthur Guy Memorial Art Prize, any sense of this indivisible unity has been shattered in favour of an all-over dotting that covers the canvas in a pulsating invocation of the aerial landscape. There are many probable reasons for this development. One reason is certainly Ward’s exposure to artworks outside her immediate cultural experience. In 2006, Ward visited Melbourne for the launch of her exhibition Ngarrangarni Manambarra. During her visit, she attended the National Gallery of Victoria, where she was given a guided tour by senior curator Judith Ryan. 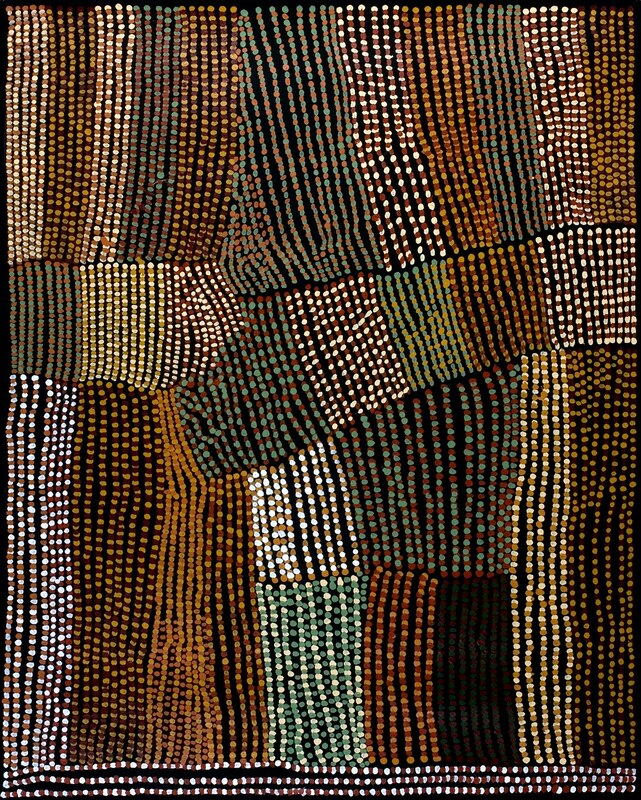 Ward was particularly taken with both the style and scale of Clifford Possum Tjapaltjarri and Tim Leura Tjapaltjarri’s monumental Napperby Death Spirit Dreaming 1980. Following the visit, she repeatedly expressed her desire to work on larger canvases, referring back to the Tjapaltjarri’s canvas as an example. 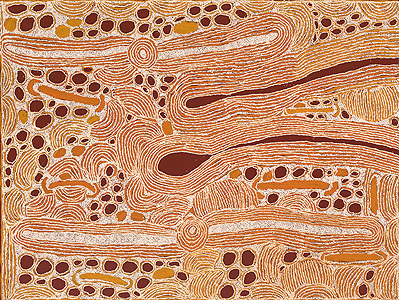 In the proceeding months, Ward not only completed several larger canvases, including the majestic 2007 Wandjinas in Ngarangarri Country (198 x 298 cm) which was exhibited in the 2008 Telstra National Aboriginal and Torres Strait Islander Art Awards, but Ward began to cover much larger sections of her canvas in shimmering dot-work, creating constellation like backgrounds to her tableaus of Wandjina, sugarbags and country. On a more local level, 2005 also saw the arrival of another profound artistic influence on Ward’s work. In that year, the senior Nyikina artist Loongkoonan began painting at the same Derby based workshop as Ward. Although belonging to a different language group, Ward and Loongkoonan began a highly competitive and influential artistic relationship. 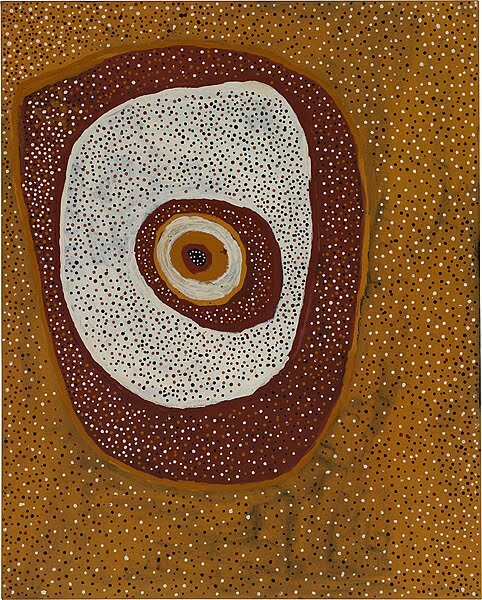 Painting alongside each other, they became like a Braque and Picasso of the Kimberley – taking on the visual lessons of each other’s work, and continually challenging each other to find new ways of developing their very different painterly practices. Despite these external prompts, however, Ward’s development has shown a clear and uniquely personal epistemic trajectory. In the paintings of Lucy Ward, each mark upon the canvas is like a fingerprint, betraying the trace of its creator’s movement. In painting her ancestral homelands, her marks revel her ownership of the country, like footprints in a landscape that she has traversed by foot, understood instinctively and known intimately. But just like a footprint, they exist as the memory of presence, a nostalgic echo of past travels. In the wake of colonial incursion, elders like Ward cannot live on their traditional lands, but return only occasionally to tend to the country of which they are the sacred custodians. Returning to her sacred sites, Ward sings out to the spirits, warning them of her arrival. Her song echoes through the stony ridges and it is as though she is a young woman again. It is this memory of the landscape that reveals itself in Ward’s paintings. Each mark connects Ward to her landscape, making her one with the Dreams, songs and topography of her land of honey. In this context, the sugarbag is a profound tripartite symbol for the personal (as Ward’s totem), the physical (the bush honey pod) and the spatial (Ngarangarri country: the land of the sugarbag dream). In shattering the individual unity of the sugarbag – literally opening it up – Ward fuses these three categories. Rather than fingerprints, the dots meld into a pointillist landscape that shimmers into being with a cosmological unity. These seemingly abstract shapes thus become a complex metaphor for the inter-relationship of identity, culture and country. They are part of a sacred and personal geography that Marcia Langton has termed ‘placedness.’ For Ward, the past is not, as L.P. Hartley has famously suggested, ‘a foreign country’, but rather a familiar country that situates and unites all moments in time. Ward’s paintings become what Langton has described as “site markers of the remembering process and of identity itself.” They inhabit a temporality that is neither past, present nor future, but part of the sacred link that connects Lucy Ward to the timeless Ngarrangarni. The following essay was written to accompany the exhibition Col Jordan: A Play on White at Mossenson Galleries in Melbourne from 5-31 October 2010. I was only a small boy when I first visited St Mark’s Basilica in Venice. It was late in the afternoon when we arrived, and the fading winter light did little to break through the cold Byzantine depths of the cavernous basilica. Near the altar, a lone curate was busily engaged in preparing the evening service. Noticing us enter the transept, he gestured enthusiastically towards the heavens, before scurrying out of sight. All of a sudden, the building was lit up – the darkness expelled by the glittering brilliance of the basilica’s golden ceilings. Above our heads, Adam and Eve circled in an endless repetition of humanity’s Fall, while higher still, a bearded Heavenly Father separated the heavens from the earth, the land from the sea, and the darkness from the light. It was like a divine evocation of the curate’s act in switching on the electric lights. With our mouths agape, we became one with the million shimmering tesserae, subsumed into the vision unfolding above us – like each tile, we gave up our individuality to partake of the majestic unity of the divine order. Col Jordan refers to his latest series of paintings as ‘The Mosaic Paintings’, but they are not mosaics in any traditional sense. Over the past four decades, Jordan has established himself as one of Australia’s foremost practitioners of hard-edge, optical abstraction, finding in it an unceasingly fertile ground for artistic experimentation and conceptual exploration. In his latest works, an overlapping selection of geometric shapes jostle for position across the white ground of the canvas, fragmented and unified by the interplay of different patterns. Jordan is a master of visual impact; high-keyed colours are offset against a ground of crisp white, giving the works an impressive bombast similar to the ceilings of St Mark’s. However, Jordan is not a religious man, and his Mosaic Paintings must be seen in a very different conceptual light to those of his religious precursors. In the mosaics of St Mark’s, the individuality of each tessera is willingly conceded to the whole – a metaphor for the believer’s role in the divine hierarchy – but Jordan’s works have none of this spiritual certainty. In fact, throughout his entire career, Jordan has relentlessly explored the boundaries of paradox, ambiguity and uncertainty. In the dynamic tensions of the picture plane, Jordan draws attention to the entirely subjective nature of vision. His paintings are, in his own words, “celebrations of the infinite variability and unpredictability of the human condition”. This exploration of paradox has reached a new zenith in Jordan’s Mosaic Paintings. My paintings are about paradox. Visual embodiments of literal impossibility. A work is good to the extent that it reconciles irreconcilables. Daedalus is about directions, tied down and boxed by the stripes of its own identity. In these stripe paintings of the 1960s and 70s, Jordan set up a tension between the unifying factor of the frame and the individuality of the coloured lines. In a sense, this is the exact opposite to the unifying of tesserae into a single image that occurs in traditional mosaics. And yet, both conceptually and visually, this strategy has its limitations. For Jordan’s paintings are not simply celebrations of unfettered individualism – rather, at their heart they recognise the need to create a “unified visual statement.” They should be seen as explorations of the delicate balance of individuality and community needed to create a democracy of vision. In this sense, Jordan’s paintings must be considered as paintings of their time. For if, on first viewing, the Mosaic Paintings appear to present a cacophony of individual voices – each shape jostling for dominance – slowly, under Jordan’s skilful hand, they unite beautifully. The artist presents the cacophony of community: a dynamic harmony forged from many voices, as in musical counterpoint. Unlike the Daedalus series, where individuality was bound by the tyranny of the frame, in the Mosaic paintings the picture plane is burst open, threatening the unity of the image. However, under Jordan’s direction, a profuse joy emerges from this confusion. From the many unfettered voices comes a vision not of tyrannically bound unity, but of participatory community. Jordan’s Mosaic Paintings are extraordinarily complex works, and they do not attempt to suggest that this sense of unity is easily achieved. In a world in which ethnic tensions and religious extremism threaten the stability of communities around the world, these paintings recognise the grand complexity of our epoch. Jordan’s paintings ask us to visualise the hardest paradox of all: how a seemingly chaotic jumble of individual entities can combine to make a world of poetry and beauty. On 2nd September this year, Australia lost one of its most original and important thinkers. 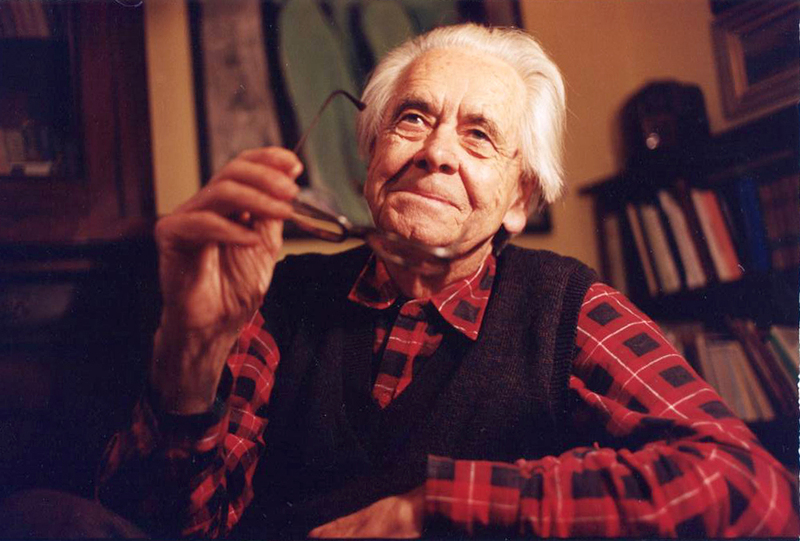 Aged 94, Professor Bernard Smith had long been hailed as the ‘father of Australian art history’ but, at their sparkling best, his writings crossed the boundaries of cultural studies, anthropology, comparative literature and sociology. I remember vividly the first time I met Bernard Smith. It was September 2003, and I was a graduate student at the University of Melbourne. Although in his retirement, the eminent scholar had agreed to an interview to discuss his recollections of the Australian art world of the late 1960s. Arriving at Jeanville, Smith’s terrace home in Fitzroy, I was ushered amiably to a seat in the front parlour beneath a large still-life by the colonial artist William Beulow Gould. To my right sat a glass display case filled with the many editions of Smith’s impresive ouvre – from his 1945 classic Place, Taste and Tradition throughto his 2002 autobiography A Pavane to Another Time. In that lone cabinet stood a virtual historiography of Australian art history, so it was with some trepidation that I offered my first question, an ice-breaker about Smith’s role in organising the 1968 visit to Australia by the American critic Clement Greenberg. “Well,” declared Smith in his distinctive warm but school-masterly tone, “we can get to that in a minute, but first, why don’t you pass me a piece of that cake.” Over the next few hours, consuming tea and jam-sponge, Smith generously recounted his first years as Professor of Contemporary Art at the newly founded Power Institute at the University of Sydney. To put it briefly, I asked him [Greenberg] to come. First of all, I thought that as at that time Greenberg was, as it were, the critical god of abstraction, that the best thing to do would be to ask him if he would come. And he did. I found him a charming man. Of course, he had his views and he wouldn’t move them an inch. The local boys who were so committed to abstraction in Sydney were delighted at his presence, but he wasn’t so keen to support them. I think he actually said, not in my presence, that he preferred the work of people like Boyd and others. I remember a hilarious case: I was hanging around one Sydney art gallery, a commercial gallery that had all these paintings up on its walls … Clem was going along, and he stops in front of [a painting by Pro Hart], and he says ‘That’s a very nice piece of painting there, isn’t it?’ Well! For many, Smith’s decision to invite Greenberg to give the inaugural John Power Lecture seemed strangely incongruous. Smith had long been a champion of social realism, and in 1959 had shown his colours by authoring the fiercely anti-abstractionist Antipodean Manifesto. Despite this, in 1971, when Smith came to revive his seminal 1962 textbook Australian Painting, he added a generous and thorough appraisal of late-modernist abstraction in Australia. This contradiction reflects the seriousness with which Smith viewed his dual role as both scholar and advocate. I’ve always been caught between history and criticism. I’m essentially a historian, and so I feel that it’s important to take a distant view of things. But every now and again I intervene on a moral or political issue. Not very often. I certainly was a polemicist when I did the Antipodean Manifesto, but what people still don’t recognise there, first of all, is that it has to be seen, not as a Sydney/Melbourne stoush. It was never that in my view. Mine was a political argument because at that time, America was exporting only abstract art, only their best abstract artists. People like Edward Hopper never got a look in. He wasn’t even particularly political. But they only did that, and that is what they were exporting here and all over the world. It was a government policy, and I felt that the artists – and they were all important artists, the figurative artists – needed some kind of defence. They were not very political people. But at any rate, having got that done, I felt that if I was going to write this other book I would have to take a historical view and say fairly what I thought of the quality of the work. But if one writes a history of Australian art, you are confronted with the logical problem ‘is there such a thing as Australian art?’ When I began looking at the early colonial stuff, I was trying to search out for those little bits and pieces that one could find that were distinct from the overall British tradition. For instance, when John Glover says ‘In Australia you can see the distant horizon through the trees’, he can see something. It’s still dominated by his interest in … but it’s there. I’ve always been looking for some kind of thing that is local. But it’s local in a universal tradition. I mean, painting didn’t develop here as an independent art. Bernard Smith dedicated his career to tracking these exchanges between the centre and the periphery, between Europe and the Antipodes. In his most important book, European Vision and the South Pacific (1960) Smith argued that it was the shock encounter of European artists with the new world of the South Pacific that ushered in the era of Romanticism in Europe. This was a radical thesis based on the principle that cultural influence did not run in one direction – from the centre to the periphery,the coloniser to the colonised; Europe to the South Pacific – but rather, that it was a matter of complex and shifting relationships. In its close attention to the representation of ‘exotic otherness’ and its effect on European consciousness, European Vision and the South Pacific preempted many of the critical issues of post-colonialism that would arise two decades later in celebrated publications such as Edward Said’s Orientalism (1978). And yet, while European Vision and the South Pacific is often compared to Said’s famous treatise, Smith was highly critical of Said’s concept of Orientalism, arguing that it created a monolithic category that oversimplified the processes of cultural flow. Smith’s thinking was always attuned to such subtleties, and he had an ability to marshall the most extraordinary range of historical and visual materials to map the specifics of such moments of exchange. Driving this was the hard-won belief that the the distance of the Antipodes did not deny our right to speak, but rather, gave us a clarity to judge, to see things as they really are. In doing so, Bernard Smith not only defined Australian art history, but staked a place for the antipodes at the table of international culture. See Peter Beilharz, Imagining the Antipodes: Culture, Theory and the Visual in the Work of Bernard Smith, Cambridge University Press, Cambridge, 1997, pp.85-86.